Why Are Young Children Most Susceptible? What are the Neurological Effects of Lead? Lead decreases neuronal growth, diminishes neurochemical development, impedes organization of ion channels,3 interferes with synapse formation, reduces the numbers of neurons,4 interferes with neurotransmission, degenerates nerve cells and causes loss of the myelin (sheaths protecting neurons). Each of these physiological effects can cause cognitive, behavioral and motor skill disabilities. What Disabilities are Associated with Lead? The effects of lead poisoning can cause emotional instability, attention deficit disorder, hyperactivity, anxiety, irritability, insomnia, excess lethargy or hyperactivity, pervasive developmental delay and loss of milestones such as language. In extreme cases there can be seizure, coma and even death. Since lead poisoning harms the central and peripheral nervous systems, victims can also experience decreased nerve conduction, a painless wristdrop (weakness of the extensor muscles of hand) and reductions in fine motor skills. Can Lead Poisoning Generate Violent Behavior? Do Adults Experience Lead Poisoning? Neurological damage can generate a number of cognitive developmental disabilities. Decreased Brain Volume in Adults with Childhood Lead Exposure, Cecil, Brubaker, Adler, Dietrich Altaye, Egelhoff, Wesse, Elangovan et al, PLoS medicine 5 (5): e112. Lead Bullet Fragments in Venison from Rifle-Killed Deer: Potential for Human Dietary Exposure, W.G. Hunt, R.T. Watson, J.L Oaks, C.N Parish, K.K. Burnham, R.L. Tucker, J.R. Belthoff, G. Hart PLoS ONE 4 (4): e5330, (2009). Zhang, Baohong, ed. Low-Level Environmental Lead Exposure and Children’s Intellectual Function: An International Pooled Analysis, Lanphear et al, Environmental health perspectives 113 (7): 894–9. The Long-Term Effects of Exposure to Low Doses of Lead in Childhood (An 11-Year Follow-Up Report), Needleman, Schell, Bellinger, Leviton & Allred, The New England Journal of Medicine 322 (2): 83–8. Lead Poisoning, Needleman, Annual Review of Medicine 55: 209–22, 2004. Lead Hazards for Pregnant Women and Children: Part 1: Immigrants and the Poor Shoulder Most of the Burden of Lead Exposure in this Country, Cleveland, Minter, Cobb, Scott and German, The American journal of nursing 108 (10): 40–9, 2008. 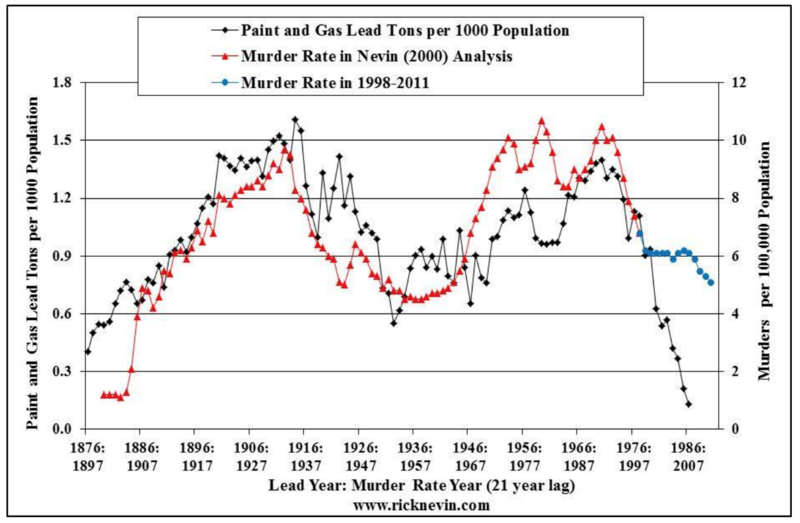 How Lead Exposure Relates to Temporal Changes in IQ, Violent Crime, and Unwed Pregnancy, Nevin, Environmental Research 83 (1): 1–22, 2000. 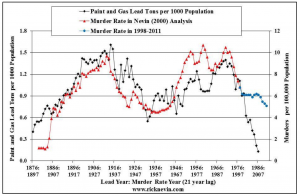 Understanding International Crime Trends: the Legacy of Preschool Lead Exposure, Nevin, Environmental Research 104 (3): 315–36, 2007. Cumulative Lead Dose and Cognitive Function in Adults: A Review of Studies That Measured Both Blood Lead and Bone Lead, Shih, Hu, Weisskopf & Schwartz, Environmental health perspectives 115 (3): 483–92, 2007. Recommendations for Medical Management of Adult Lead Exposure, Kosnett, Wedeen, Rothenberg, Hipkins, Materna, Schwartz,; Hu & Woolf, Environmental health perspectives 115 (3): 463–71, 2007. Lead and Compounds / Environmental Toxicants: Human Exposures and Their Health Effects (3rd ed. ), Lippmann, Wiley-Interscience, 2009.